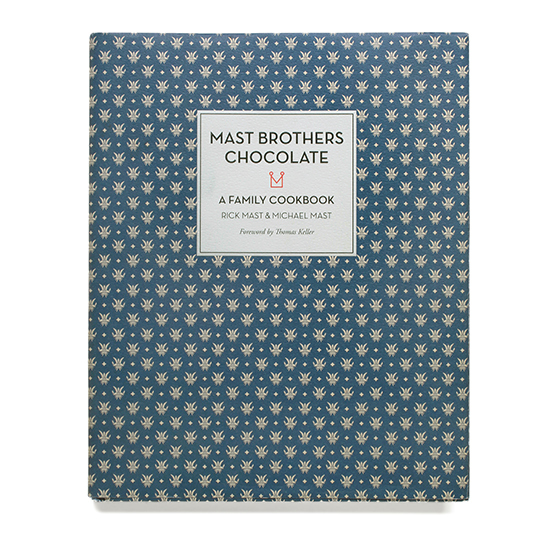 This week's inspiring new book comes from Mast Brothers Chocolate: A Family Cookbook by Rick Mast and Michael Mast. With their beards and eponymous $10+ bean-to-bar chocolate bars wrapped in custom designed paper, the Mast brothers are poster boys for the Brooklyn craft food movement. Their story, which they tell beautifully through a series of essays in their new cookbook, is a great American entrepreneurial one: They taught themselves to make chocolate from raw cacao in their Williamsburg apartment (back when the über trendy neighborhood still had some grit) and later maxed out several credit cards to set up shop to sell. Like a lot of great business stories, it's a tale filled with some luck and lots of hard work. But it's also one that's extra inspiring because the brothers have managed to grow their business into a larger space with many more employees without compromising on the quality of their chocolate. While the essays and the photographs—shot by Tuukka Koski with a dark, moody gray-blue color palate—are the star of the book, the collection of recipes are a fun mix of nostalgia (Chocolate Milk Shakes and Chocolate Pudding) and quirk (Cocoa Nib Scallops and Chocolate-Cranberry Pork Tenderloin). Unlike Valerie Gordon's Sweet, which goes into great detail about, say, what the sugar should look like as it's melting into caramel, the Mast Brothers' recipes are spare, written like a grandmother's or those from a community cookbook. The style works well for recipes like the Chocolate Soda, which don't need to be over thought, but could be more frustrating for more involved recipes, like the Peanut Butter Cups, in which the instructions say, "Coat 24 mini muffin cups with tempered chocolate and refrigerate to set." Are the cups lined? And what's the best way to coat the cups? Still, even if I’m not drawn to every recipe, I want this book on my shelf to for when I’m craving chocolate, needing entrepreneurial inspiration or just wanting something beautiful to browse.